Trove is the National Library of Australia’s “discovery interface” – an amazing catalogue of books, newspapers, maps, music, journal articles etc. The Trove API is a special website that programs can talk to run queries, retrieve individual records etc. With some creative ideas and a bit of coding skill, you could make a pretty nifty tool and win a digital humanities award. The documentation is pretty thorough, but doesn’t tell you how to get started. These days, web development is mostly about assembling the right tools and putting them together, but it can be hard for a novice to know what they need. You’re not very familiar with coding against an API, or writing web applications. In short, if you think the digital humanities might be for you. A server on which to run your web application. You can use your laptop directly, but better to use a virtual machine inside your laptop. Even better, a server running on the internet, like a VM on the NeCTAR Research Cloud. Our server logic, expressed as code in files. As an Australian academic, you can create your own server on the NeCTAR Research Cloud. That would be the best option, but can be a bit fiddly for a novice so we won’t explain that here. The next best option is to create a server on a virtual machine inside your laptop, using VirtualBox and Vagrant. That keeps everything related to this one project self contained, which is a big bonus when you start working on other projects. It also creates a pristine, controlled Linux environment which means you’re less likely to run into issues cause by the peculiarities of your own system. Try the Vagrant Getting Started guide. As a last resort, the simplest approach is to just install stuff directly on your computer. This may work ok to begin with. But a web application is probably what you’re going to want eventually and is the easiest to share with other people. We’ll use Python, the programming language, and Flask, a web application framework for Python. That is, first you install Python’s “pip” installer. Pip then knows how to install Python packages like Flask. Whatever server you’re using, create a directory somewhere (perhaps under your home directory), called ‘trovetest’. But it’s easier than that, if we use the Requests library. Create a directory under ‘trovetest’ called ‘static’, and download and unzip the latest jQuery. 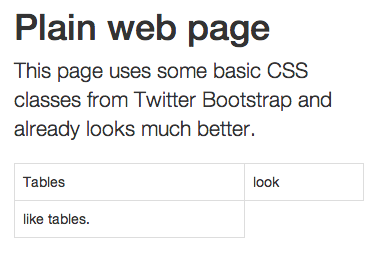 Adding Bootstrap and minimal changes. Although it’s best to download both jQuery and Boostrap to your server and link to them there, you can get started quickly by linking to them on the web. Just include this text at the top of your HTML files. When you tell the web application framework to render the page, you pass in the list of variables – in this case, an object called ‘article’ with an attribute ‘name’. We’ll use the Jinja2 templating engine, because that’s what Flask uses. Now that everything is in place, let’s write a simple application that will simply make one request. 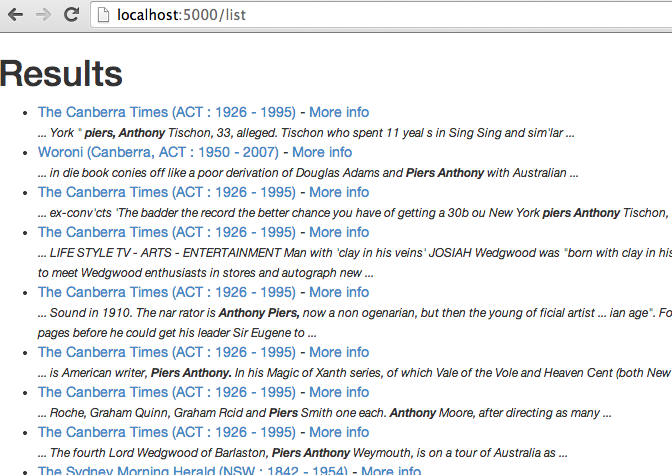 We’ll ask the Trove API for a list of newspaper articles mentioning Piers Anthony (to follow their documentation’s example). @app.route("/list") # this is what we do when someone goes to "http://localhost:5000/list"
'key': apikey, # following the Trove API documentation. 'encoding': 'json', # we specify 'json' as the format because json is easy to parse. # After calling requests.get(), r is now an object containing lots of information about the response - errors codes, content etc. r.encoding = 'ISO-8859-1' # We avoid some unicode conversion errors by adding this step. Flask will sit there waiting for someone to connect to your webserver in a browser. The results of our little Trove query. That was a very quick, high level view of all the pieces you need. If you made it through the example, you’re be in an excellent position to start making interesting web applications building on the Trove API. There’s no shortage of information on the web about all these technologies – the hard bit is knowing what you need to know. Tim Sherratt (aka @wragge) has made many fun creations with the Trove API, documented on his discontents.com.au blog. Tim works for the Trove team, who are generally pretty happy to help . could you suggest what code should go in simple.py? Looks like somewhere the actual sample code for simple.py got mangled. Fixed now!